This week, OSFI (Office of the Superintendent of Financial Institutions) announced that effective January 1, 2018 the new Residential Mortgage Underwriting Practices and Procedures (Guidelines B-20) will be applied to all Federally Regulated Lenders. Note that this currently does not apply to Provincially Regulated Lenders (Credit Unions) but it is possible they will abide by and follow these guidelines when they are placed in to effect on January 1, 2018. • restrictions to transactions designed to work around those LTV limits. The new guidelines will require that all conventional mortgages (those with a down payment higher than 20%) will have to undergo stress testing. Stress testing means that the borrower would have to qualify at the greater of the five-year benchmark rate published by the Bank of Canada (currently at 4.89%) or the contractual mortgage rate +2% (5 year fixed at 3.19% +2%=5.19% qualifying rate). Qualifying at a rate of 5.34% (contract mortgage rate +2%) with a 25-year amortization and the combined annual income of $85,000 you would be able to purchase a home of $455,000. OUTCOME: This gives a reduced borrowing amount of $105,000…Again a much lower amount and lessens the borrowing power significantly. A dual-income family with a combined annual income of $85,000.00. The current value of their home is $700,000. They have a remaining mortgage balance of $415,000 and lenders will refinance to a maximum of 80% LTV. The maximum amount available is: $560,000 minus the existing mortgage gives you $145, 0000 available in the equity of the home, provided you qualify to borrow it. Qualifying at a rate of 3.34 with a 25-year amortization, and a combined annual income of $85,000 you are able to borrow $560,000. If you reduce your existing mortgage of $415,000 this means you could qualify to access the full $145,000 available in the equity of your home. Qualifying at a rate of 5.34% (contract mortgage rate +2%) with a 25-year amortization, combined with the annual income of $85,000 and you would be able to borrow $455,000. If you reduce your existing mortgage of $415,000 this means that of the $145,000 available in the equity of your home you would only qualify to access $40,000 of it. OUTCOME: That gives us a reduced borrowing power of $105,000. A significant decrease and one that greatly effects the refinancing of a mortgage. Mortgage Bundling is when primary mortgage providers team up with an alternative lender to provide a second loan. Doing this allowed for borrowers to circumvent LTV (loan to value) limits. 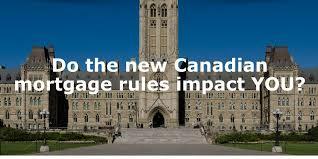 Under the new guidelines bundled mortgages will no longer be allowed with federally regulated financial institutions. Bundled mortgages will still be an option, but they will be restricted to brokers finding private lenders to bundle behind the first mortgage with the alternate lender. With the broker now finding the private lender will come increased rates and lender fees. A dual income family that makes a combined annual income of $85,000 wants to purchase a new home for $560,000. The lender is requiring a LTV of 80% (20% down payment of $112,000.00). The borrowers (our dual income family) only have 10% down payment of $56,000.. This means they will require alternate lending of 10% ($56,000) to meet the LTV of 20%. The alternate lender provides a second mortgage of $56,000 at approximately 4-6% and a lender fee of up to 1.25%. OUTCOME: The interest rates and lender fees are significantly higher under the new guidelines, making it more expensive for this dual income family. These changes are significant and they will have different implications for different people. Whether you are refinancing, purchasing or currently have a bundled mortgage, these changes could potentially impact you. We advise that if you do have any questions, concerns or want to know more that you contact us at info@ottawashometeam.com or call us direct 613-612-2111 or 613-203-2030. We can advise on the best course of action for your unique situation and can help guide you through this next round of mortgage changes. Today, the Office of the Superintendent of Financial Institutions Canada (OSFI) published the final version of its Guideline B-20. The revised Guideline, which takes effect January 1, 2018, applies to all federally regulated financial institutions. We were pleased that OSFI agreed with our recommendation not to create a prohibition on all co-lending activities and instead clarified that the restrictions only apply to arrangements that are designed to circumvent existing laws or policies. We are however disappointed with the decision to implement a new stress test at a 200 basis points level. We expect this will encourage more people to take shorter term mortgages, putting more borrowers at risk should interest rates rise dramatically. We believe the new qualifying rate will have negative implications for the Canadian mortgage finance market and the national economy as a whole. Following this announcement, will continue our discussions with the Ministry of Finance and the Bank of Canada about the methodology used to set the 5 year bench mark. OSFI will be holding information seminars later this fall to discuss implementation expectations. The minimum qualifying rate for uninsured mortgages will be the greater of the five-year benchmark rate published by the BoC or the contractual mortgage rate +2%. As always we will continue to keep you updated on the latest developments as they are announced. The mortgage rule changes that were passed by the Ministry of Finance in October 2016 are still having their effect one year later. Higher qualification requirements and new bank capital requirements have split the industry into two segments – those who qualify for mortgage insurance and those who don’t. Mortgages that qualify for mortgage insurance are basically new purchases for borrows that have less than 20% down and can debt-service at the Bank of Canada Benchmark rate (currently 4.89%). Those who don’t are basically everyone else – people with more than 20% down payment but need to qualify at the lower contract rate, and people who have built up more than 20% equity in their homes and are hoping to refinance to tap into that equity. The biggest difference we are seeing is two levels of rate offerings. Those that qualify for a mortgage insurance by one of the three insurers in Canada (CMHC, Genworth and Canada Guaranty) are being offered the best rates on the market. Those who don’t qualify cost the banks more to offer mortgages due to the new capital requirements and so are offered a higher rate to off-set that cost. Dominion Lending Centres’ President, Gary Mauris, wrote a letter to the Prime Minister and the Minister of Finance at the beginning of October 2017 outlining the negative impact of those changes on Canadians on year later. That letter was also published in the Globe and Mail. CLICK HERE to see that letter. But even more alarming are the rumblings being heard about another round of qualification changes that will see those who have been disciplined in saving or building equity having to qualify at a rate 2.00% higher than what they will actually get from their lender. Where the first round of changes in 2016 saw affordability cut by about 20% for insured mortgages, this new round of changes will have much the same impact on the rest of mortgage borrowers – regardless of how responsible we’ve proven to be. The mortgage default rate in Canada is less than 1/3 of a percent. We Canadians simply make our mortgage payments. So where’s the risk? The new qualification rules are intended to protect us from higher rates when our current terms come to an end. But when most Canadians are already being prudent, borrowing at well below their maximum debt-to-income levels the question now is why do we need to be protected from ourselves? The latest round of rule changes are rumoured to be coming into effect by the end of October 2017 so our word of advice to at least those who have been contemplating a refinance to meet current goals? Contact us to find out your options before your window of opportunity is closed. One year ago, your government introduced new mortgage rules that put the dream of home ownership out of reach for many Canadians. Although well intended, the changes have reduced the average Canadian family’s purchasing power by upwards of 20 per cent, and have had the unintended consequence of making housing less affordable for Canadians. Instead, Canadians who were once able to purchase or re-finance their home are being shut out of the market or forced to pay more interest to traditional lenders as competition in our sector declines. The new stress test that requires all new mortgages to qualify at the greater of either the Bank of Canada benchmark rate or the contract rate offered, means that Canadians who previously could reasonably afford a mortgage payment at the standard rates no longer qualify. Additionally, changes to portfolio insurance requirements have resulted in some monoline lenders being unable to insure mortgages, thus reducing overall competition, which hurts consumers, regardless of what solution they use for their homes. Canadians who are now unable to fulfill their dream of owning a home have been telling us their stories and we’ve been listening. We’ve documented their stories and we think it’s important for you to see them. We’ve posted these stories at www.NewRulesHurt.ca and are sending every Member of Parliament a printed copy so they can read firsthand how the new mortgage rules have impacted the lives of hard working individuals and families in their constituencies. Please take the time to read these stories and seriously consider changing mortgage rules to make them fair and equitable for all Canadians trying to purchase, or keep their home.